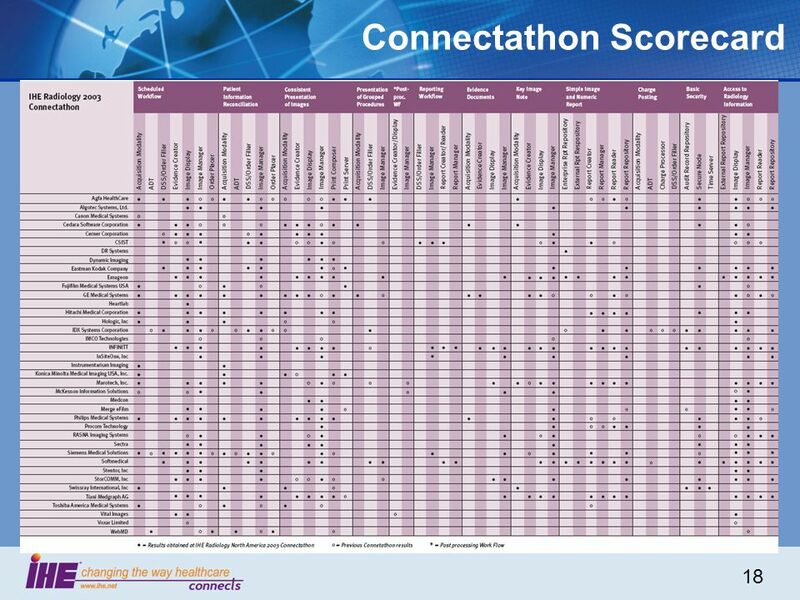 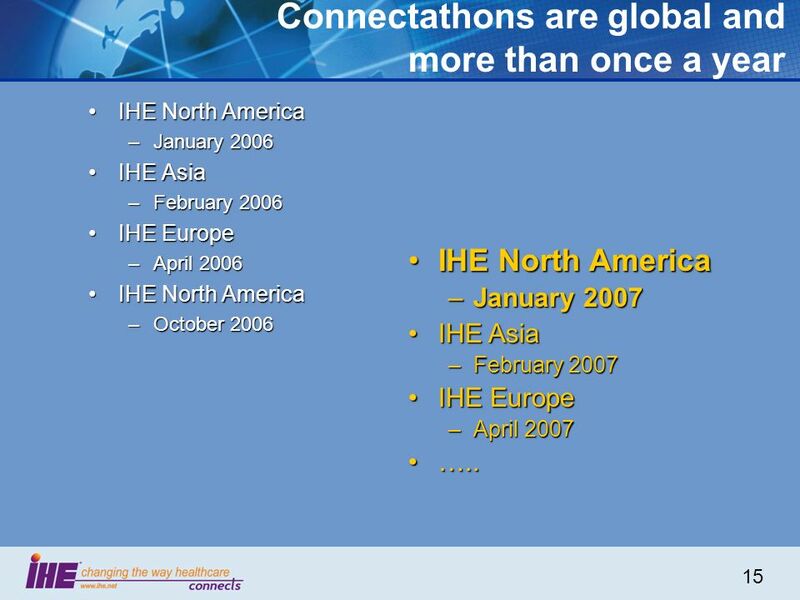 15 15 Connectathons are global and more than once a year IHE North AmericaIHE North America –January 2006 IHE AsiaIHE Asia –February 2006 IHE EuropeIHE Europe –April 2006 IHE North AmericaIHE North America –October 2006 IHE North AmericaIHE North America –January 2007 IHE AsiaIHE Asia –February 2007 IHE EuropeIHE Europe –April 2007 …..…..
23 23 Connectathon Tour You will be led by docentsYou will be led by docents There will be a number of stopping points, illustrating different aspects of the ConnectathonThere will be a number of stopping points, illustrating different aspects of the Connectathon Staggered departure, in order to minimize disruptionStaggered departure, in order to minimize disruption Feel free to observe and listen, but respect the effort that is underway and refrain from disrupting the engineers at work!Feel free to observe and listen, but respect the effort that is underway and refrain from disrupting the engineers at work! 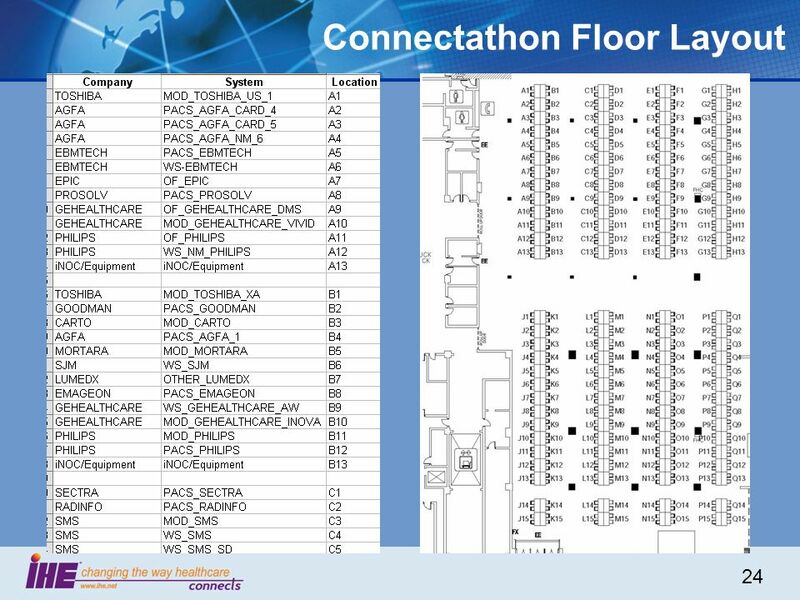 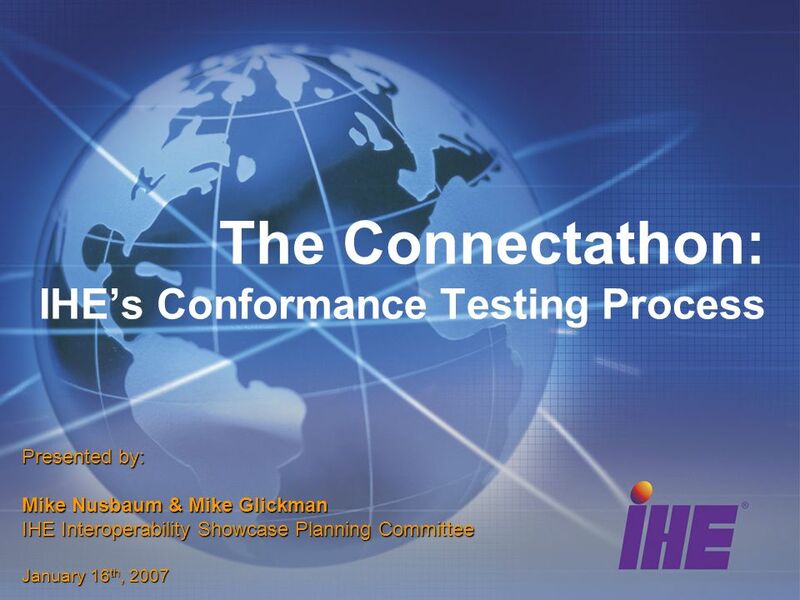 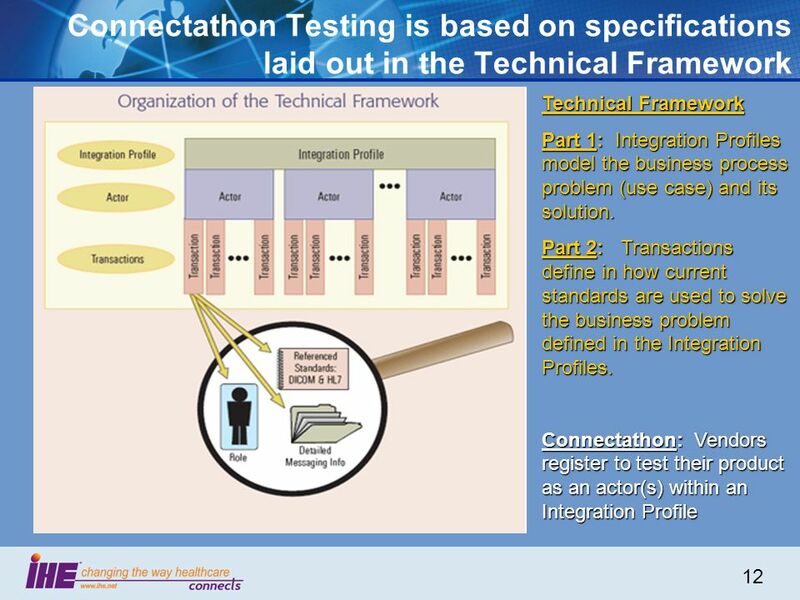 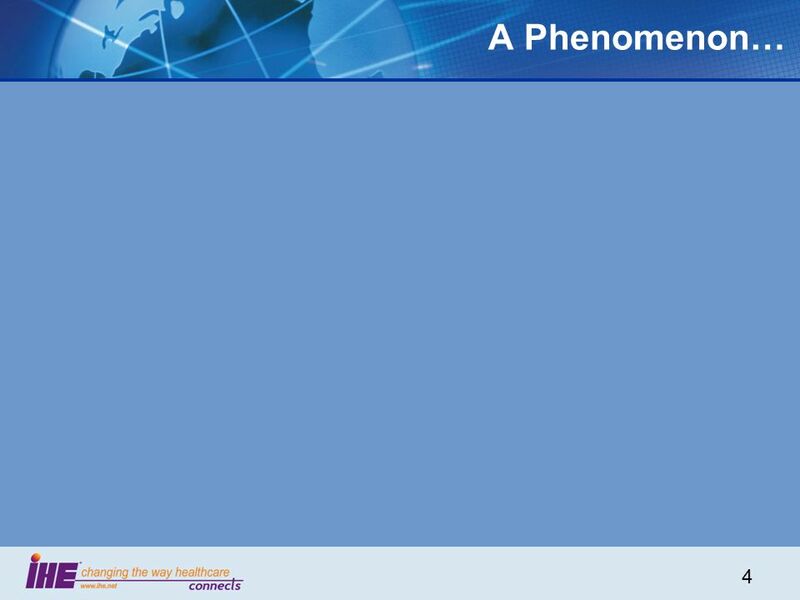 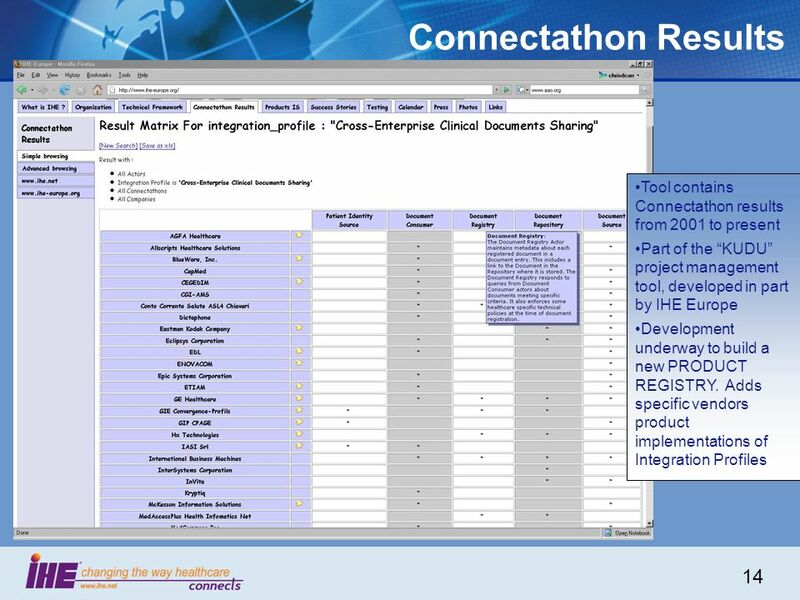 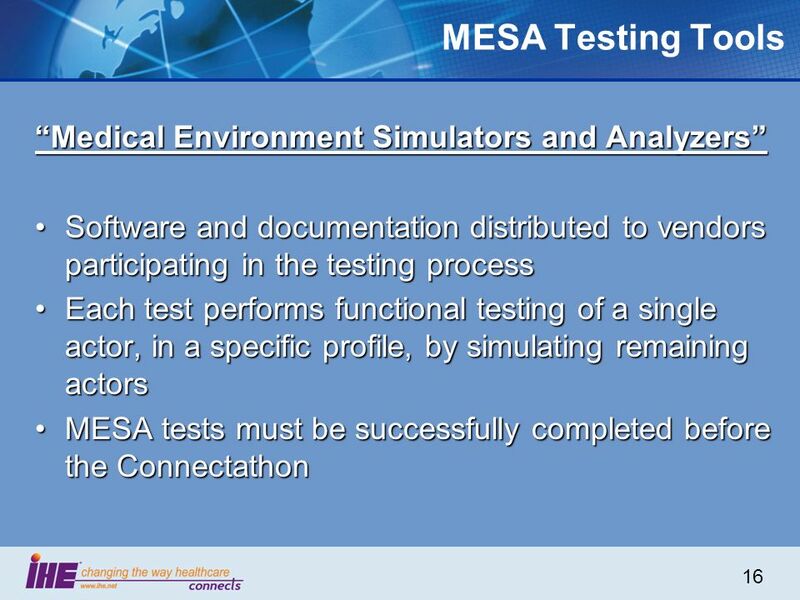 Download ppt "The Connectathon: IHEs Conformance Testing Process Presented by: Mike Nusbaum & Mike Glickman IHE Interoperability Showcase Planning Committee January." 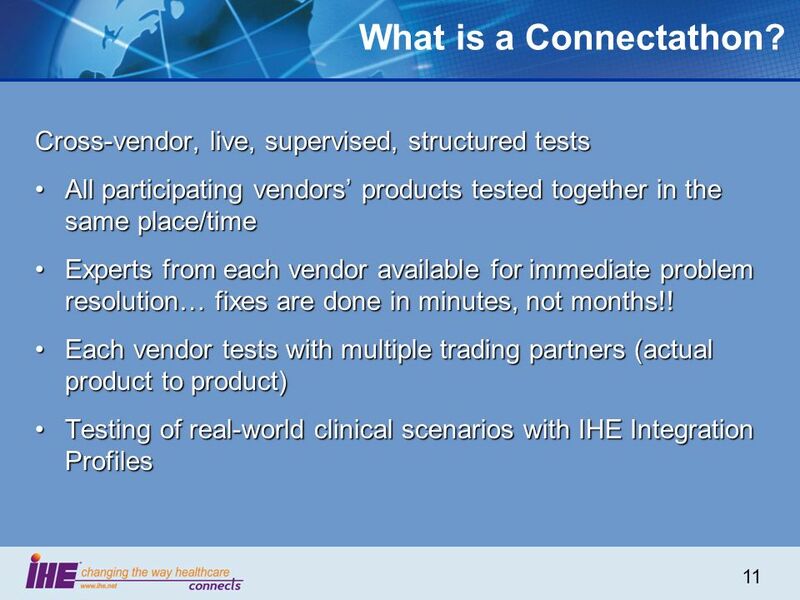 Integrating the Healthcare Enterprise IHE Overview Keith W. Boone Interoperability Architect, GE Healthcare Co-chair, IHE Patient Care Coordination PC. 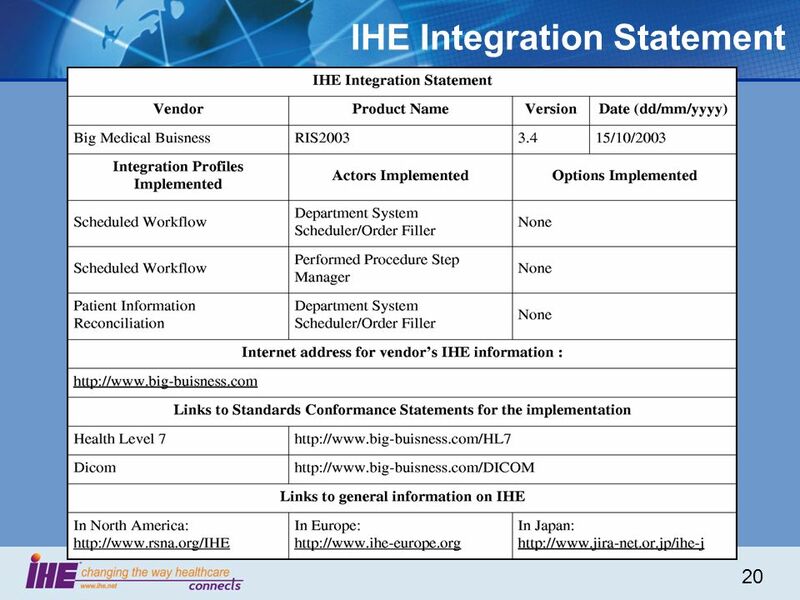 September, 2005What IHE Delivers 1 Kevin ODonnell, Toshiba Medical Systems Co-chair IHE Radiology Planning Cmte IHE Radiology Update. 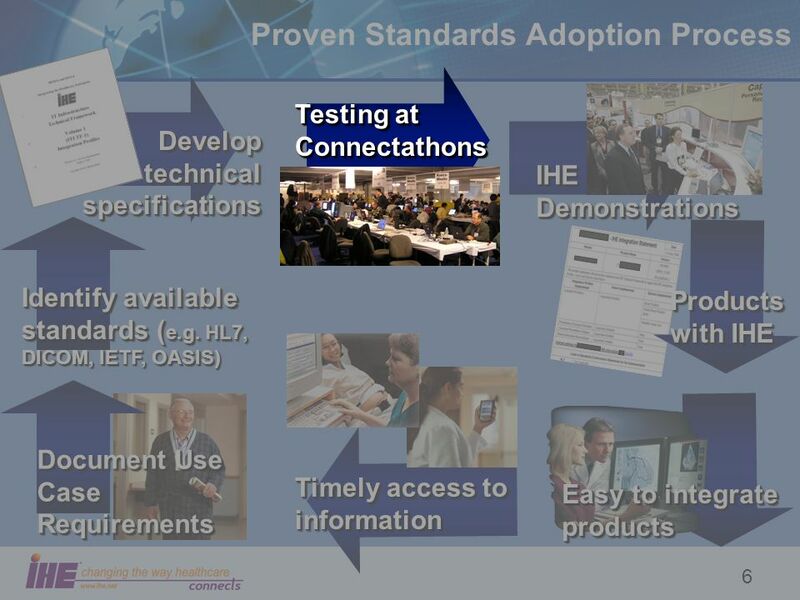 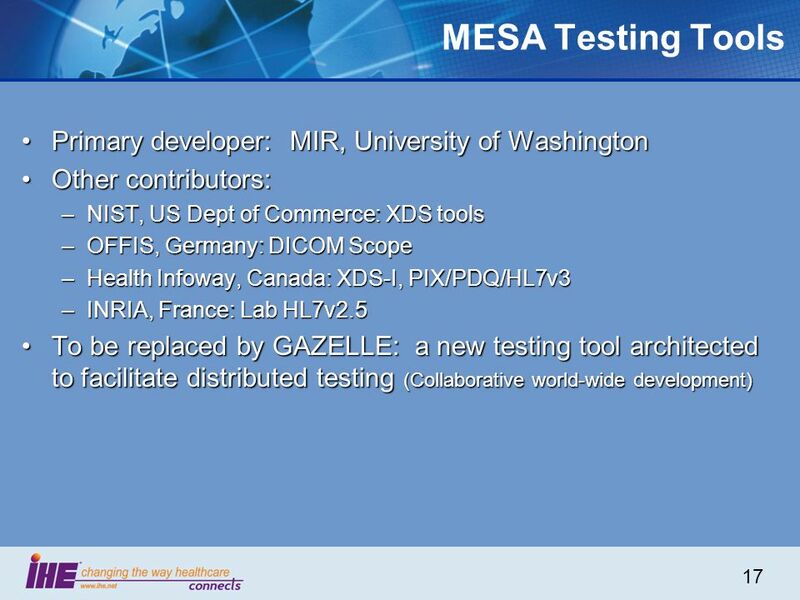 September, 2005What IHE Delivers 1 HIMSS 2006 – Interoperability Showcase François Macary, AGFA HCES IHE Lab Committee co-chair IHE Clinical Laboratory. 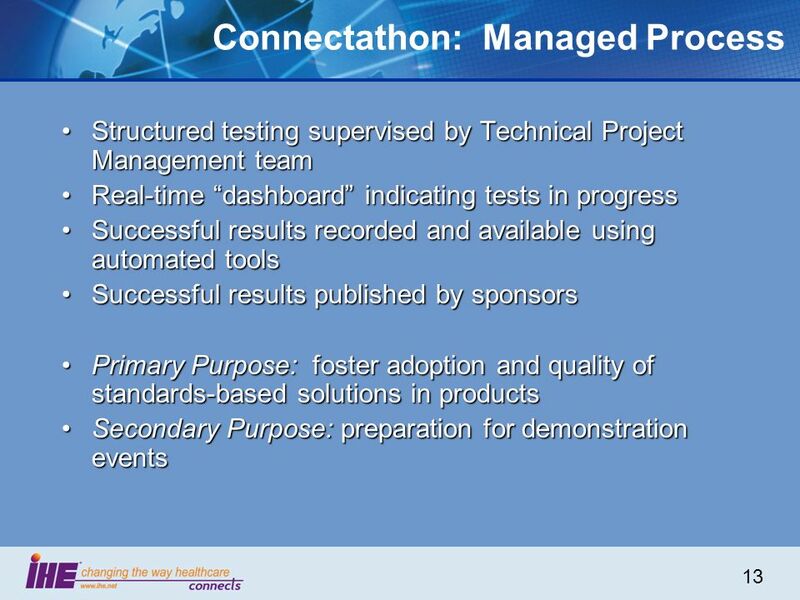 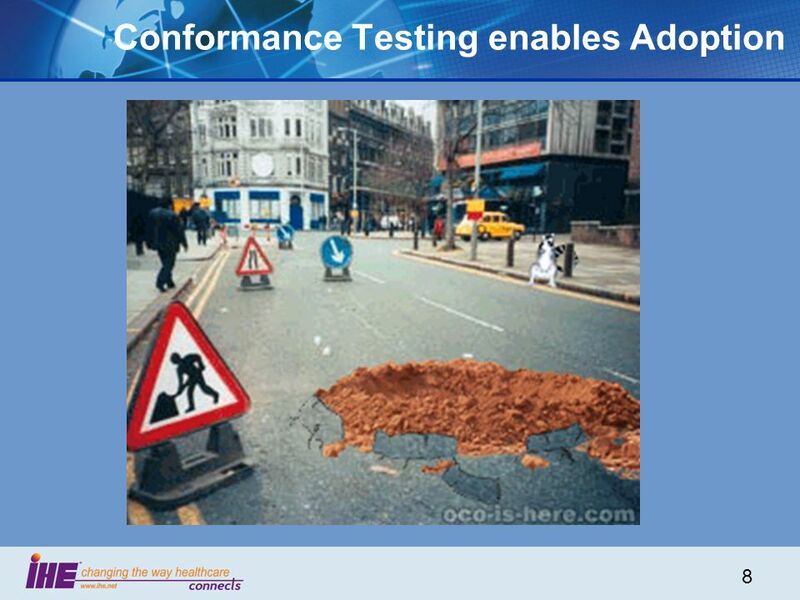 The Connectathon: IHEs Conformance Testing Process Presented by: Mike Nusbaum & Mike Glickman IHE Connectathon & Interoperability Showcase Planning Committees. 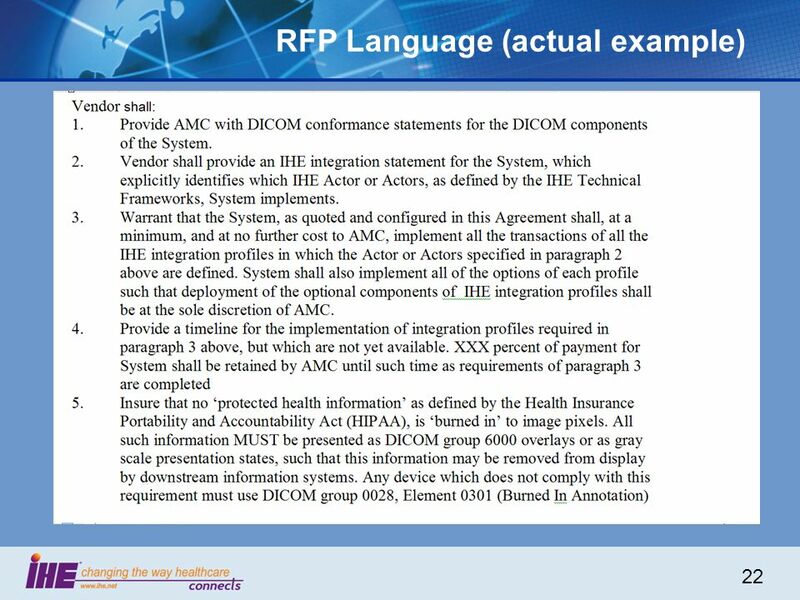 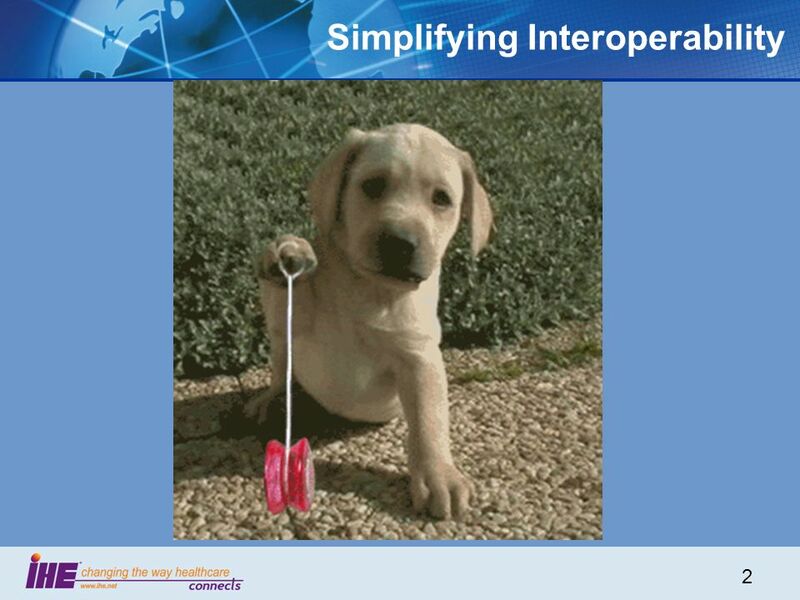 Buying IT Systems with Interoperability Built-In Fact or Fiction?? 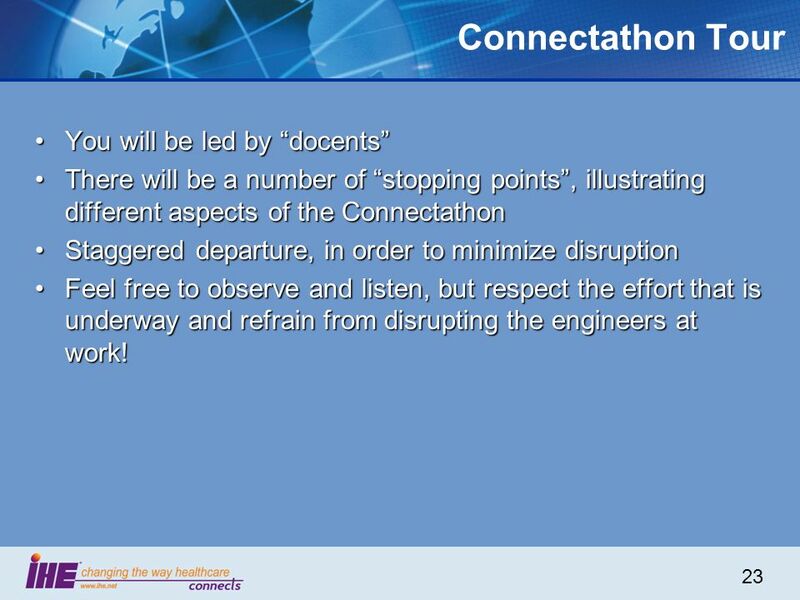 Michael H. Nusbaum HIMSS Virtual Conference November 7 th, 2007. 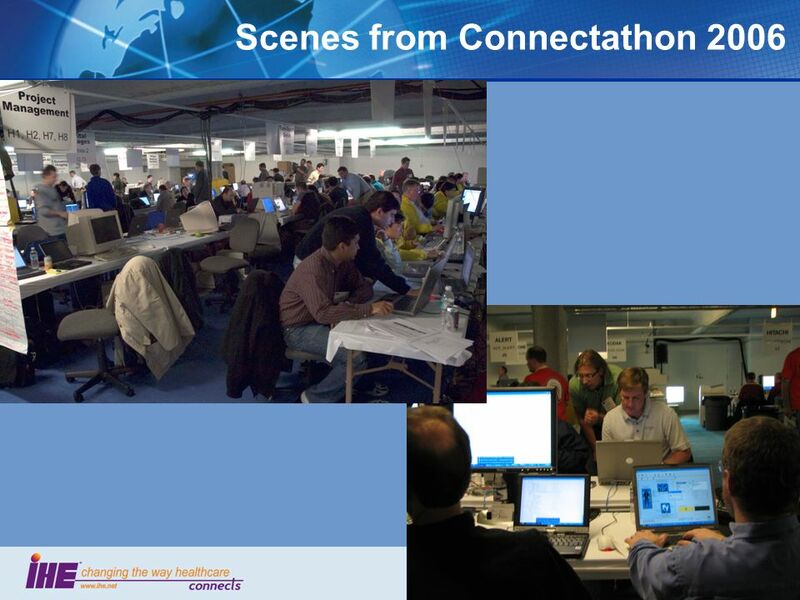 June - September Part II: 2010 NA Connectathon Participants Part II: What 2010 NA Connectathon Participants need to know: Connectathon. 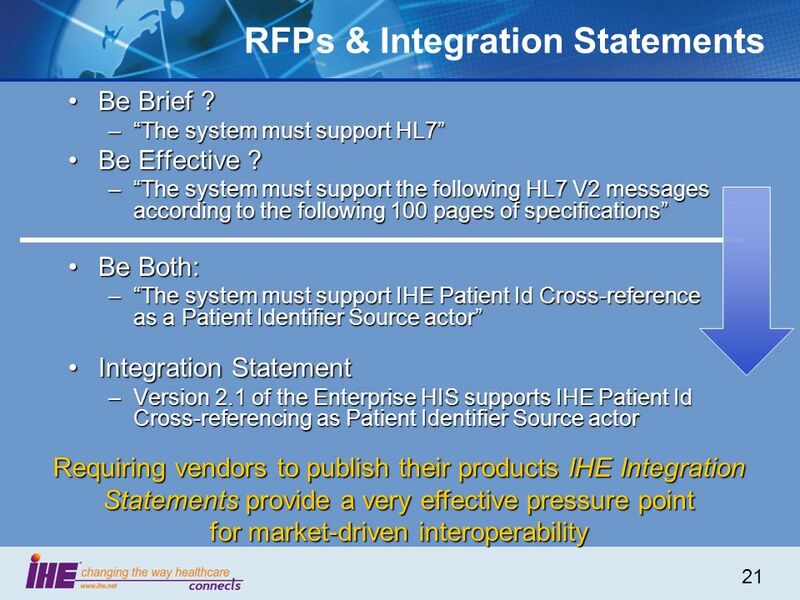 Integrating the Healthcare Enterprise The Basics of IHE: Concepts and Process Associate Professor of Radiology Chief, Imaging Informatics Northwestern. 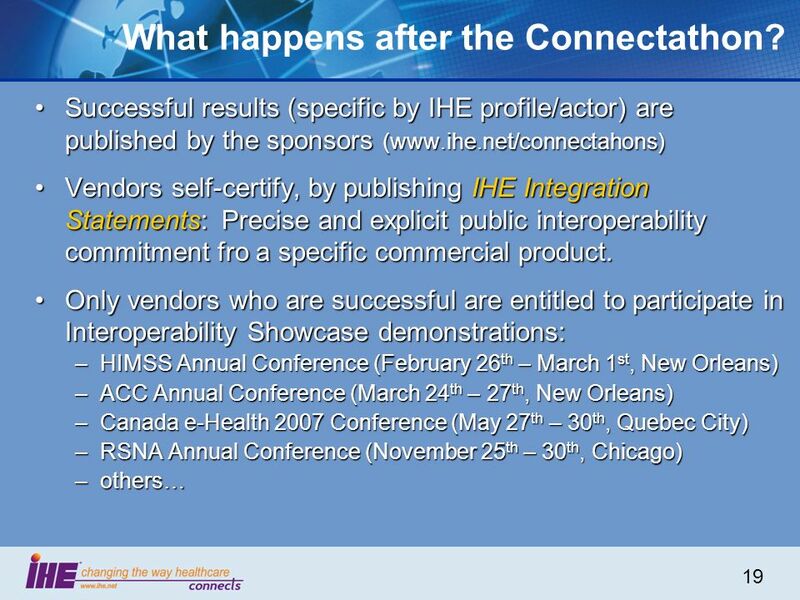 Leveraging IHE for Interoperability in the Enterprise Michael H. Nusbaum MH Nusbaum & Associates John T. Donnelly IntePro Solutions. 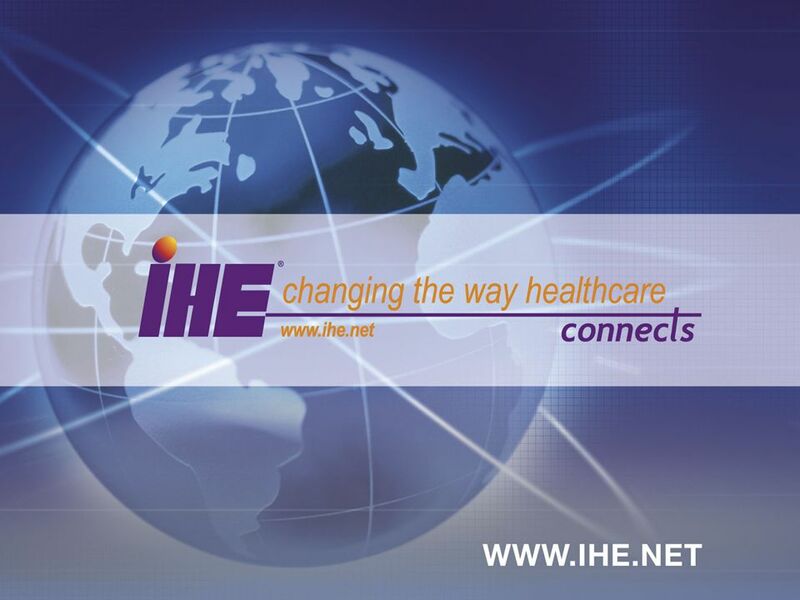 Brought to you by IHE Sponsors and Committee Members Welcome to the Interoperability Showcase. 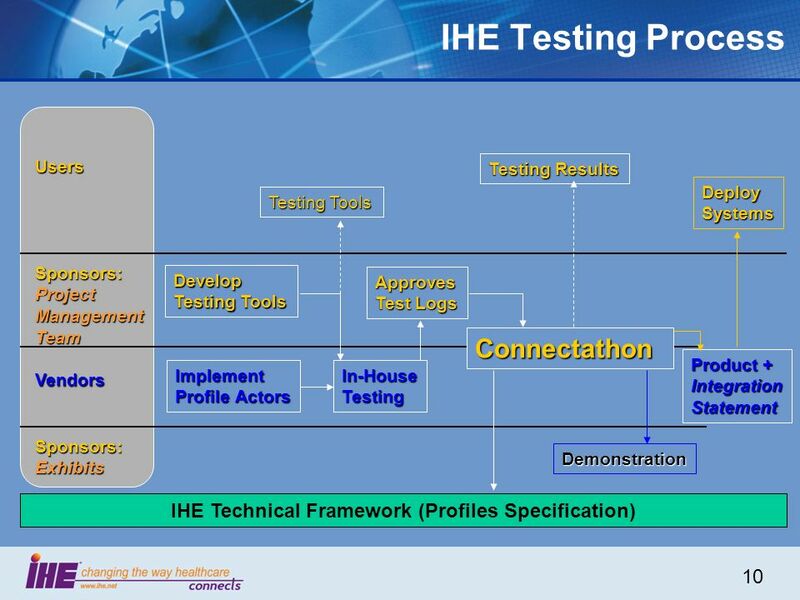 Jonathan L. Elion MD, FACC Co-Chair, IHE Cardiology Planning Committee The Basics of IHE: Concepts and Process EyeEh?Chi. 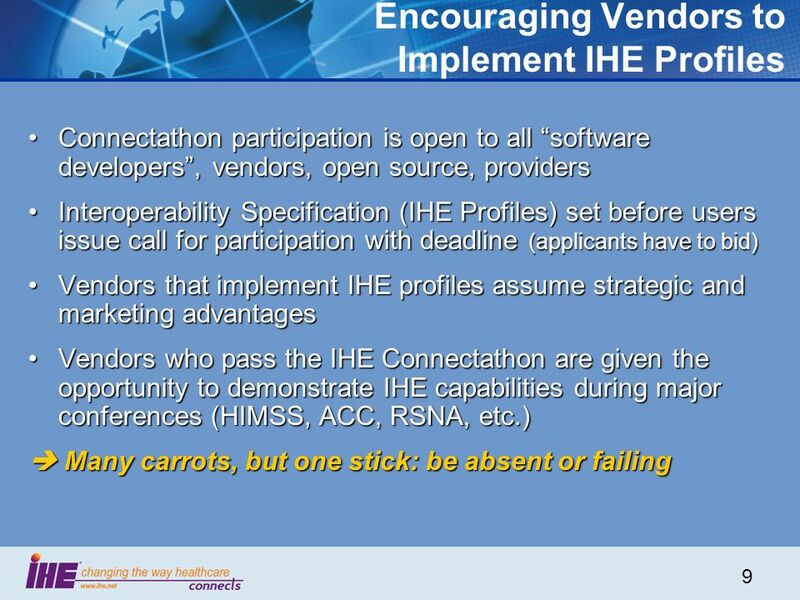 September, 2005What IHE Delivers 1 IHE Sponsors and Committee Members Welcome to the Interoperability Showcase.